Today I spent a few special moments with one of the most adorable creatures I have come across in a while (excluding my boyfriend!). 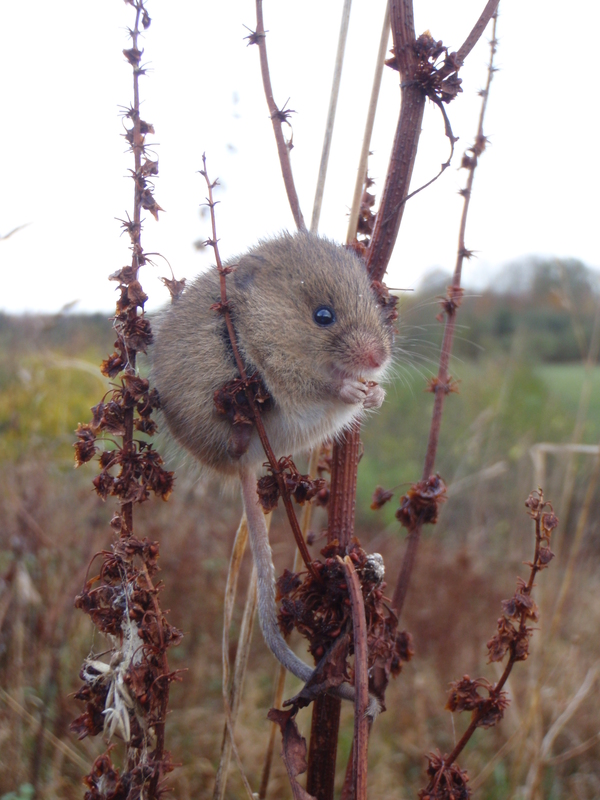 As part of a project I am working on, I get to come up close with a variety of small mammals (mice, voles and shrews). Some species are more “cute and cuddly” than others, and this guy tops the list! This photo (not my best!) was taken on the side of a hill on the edge of a woodland, where one of the survey sites in. Over the past week and a half, I have been close to many harvest mice (dværgmus), bank voles (rødmus), field voles (markmus), yellow necked mice (hålsbåndsmus), a small number of house mice (husmus) and two species of shrew (spidsmus). The (Eurasian) harvest mouse Micromys minutus is the smallest rodent in Europe. They range in color from a dark grayish brown to a pale hazelnut brown (from what I have seen at this time of year anyway!). The are very small, weighing from 4 to 11g and have a fantastic prehensile tail. This means their tail is specially designed to grasp or hold on to things, which makes them very agile climbers! It is wonderful to watch, in those rare short moments where I get to observe the mouse before it darts undercover. If you would like to see some more amazing photos, check out this link, which I stumbled upon. Two photographers spent a year capturing the life of harvest mice, sitting very still and waiting! Stunning shots! I guess field work has it’s benefits after all! Today was my first day “back in the field” in a while. After prolonged periods of office work, my brain seems to form some sort of romantic views about what happens “in the field” (which can in reality be anywhere outside the office!). I only seem to remember the good days. The days where it is sunny, calm and everything goes to plan. There is nothing heavy to carry and the field work takes place in flat open areas. Today those romantic memories faded somewhat as I was brought back to reality! My day started with getting the keys to one of the work vehicles – a positive start. I will be in charge of a 4×4 for the next three weeks, but alas, the distance from the office to the field site is rather short, and my 4×4 is simply a luxury wheelbarrow! But thankfully, when I need a place to take refuge from the wind and the rain, I will have the jeep near by (you can’t hide in a wheelbarrow, not comfortably anyway!). After this I collected the equipment (not too heavy!) I needed and headed into the woods. It started pleasantly with open woodland, a carpet of beautiful colored leaves on the ground. Thankfully the gale force winds from the morning had dropped off and the rain had taken a break, but needless to say, everything I touched was still wet, very wet! As I ventured further into the woods, it became more difficult to walk, the bramble closed in and a fight began. Suddenly the romantic memories parted and I began recalling days like this in the woods in south Wales. Like serpents of the woods, bramble wrapped around your boots, between your laces and grabbed your socks, trying to trap you in the woods forever (dramatic, I know!). Then there were the nettles, tall and ready to bite. I was warned, and now the left hand side of my face burns in a strange way. But thankfully, doing field work this late in the season has one benefit. The leaves are falling, the grass is dying, plant life is starting to rest for the winter. It’s not only the plant life I can avoid worrying about, but the small insects too. There in one in particular that targets me for my delicious (so it seems!) blood – the tick! Over the last 2 years I have been plagued by their attention. If walking in a group, no one else needs to worry, they will for some reason prefer me! But now that the temperature has dropped, and the first frost has arrived, I won’t have to be too vigilant in my tick checking – which is a little difficult when you are alone! I wonder what else I will “remember” about field work over the next few days!